When I teach I like to vary the lessons to keep my classes interesting. 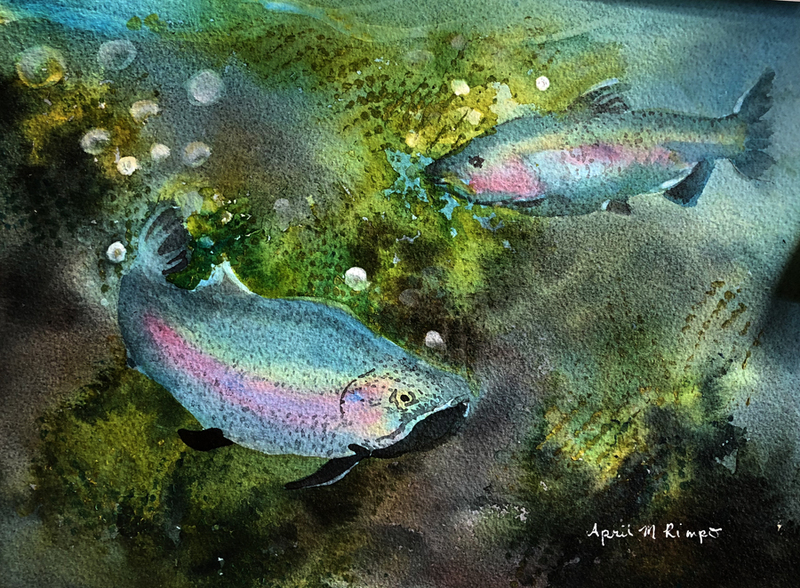 Sharing Fish Tales was a new lesson in my last Fun with Fluid Acrylics workshop held at the Columbia Art Center. This was my practice painting before the class so I knew how to go about teaching each step of the process. It's important to me to have a well planned class to be sure we can cover all the material. I am delighted that I just sold this painting, which brought back great memories from the purchaser's childhood. I do love when my work touches someone this way. This 2-Day workshop was packed with three lessons that build upon each other. In other words, skills learned in the first lesson were used in the second, then techniques from the second were reused in different ways in the third lesson. I always bring along examples of my work where I have used the techniques in similar ways but with different subject matter to allow everyone to see some options of where they might go with what they are learning. A few samples of the paintings generated by the students. 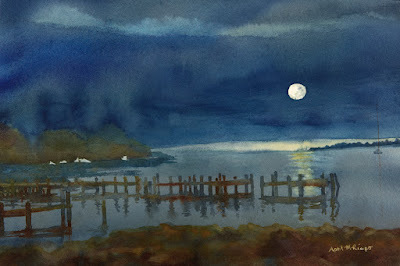 I also taught a couple Nighttime Landscapes in Watercolor classes this fall. Like the Fun with Fluid Acrylics class I had done research before the class to try to optimize the chances of success of the student's paintings. In this case the research was related to what pigments would work best for nighttime landscapes. 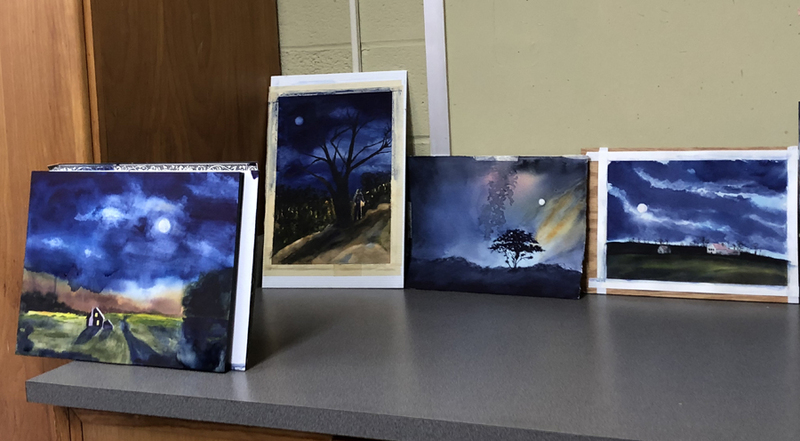 I identified some blue orange complements that looked like they would work to create dramatic night skies in a blog post by Jane Blundell. If you follow that link you will see Jane Blundell was not investigating night skies but her color studies allowed me to identify a few blends that would get dark enough when blended properly. When I received the tubes of painting I tried mixes of each complement to see which gave me the rich darks I wanted and allowed me to create some nice muted browns and greens for the landscape. I ended up with 4 pigments to use for the paintings which I recommended to the students. I also let them bring their own pigments if they didn't want to buy and recommended single pigment paints since they are less prone to getting "muddy" - a term artists use when the paints mix to dull colors that are no longer luminous. I was thrilled by the results from both of these classes. 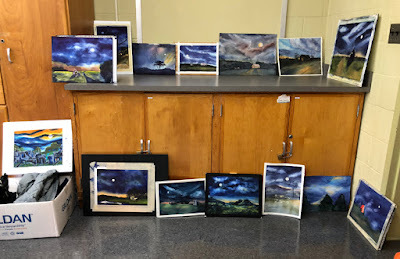 The students brought their own references for the nighttime class with Baltimore Watercolor Society; I love the variety of sites. Here are a few images of their work for you to enjoy. Interested in April's classes? 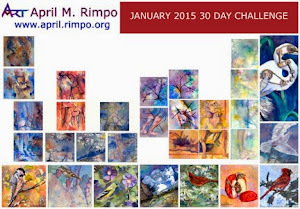 Consider becoming a Studio Friend by signing up for her twice-monthly email. April segments her newsletter so you can select topics you'd like to hear about when you sign up. For those who include a selection of General Interest you will receive emails about twice-monthly. If you are only interested in classes, then the emails will be much less frequent discussing upcoming classes and how to register. Thank you for your interest. Click here to Contact April or visit her website to explore her paintings on the Art page.